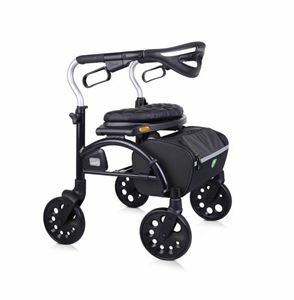 The Xpresso Zero series with the Roman arch design is the stylish, strong, stable walker with a most lighweight frame out of all the center folding walkers available today in the market. It has cable free brakes with easy to adjust handle height. Basket is durable and collapsible. Zero has a center folding mechanism which makes it compact and easy for transport. Foldable basket: Basket can be folded and removed and is also completely covered for privacy. Seat Height 18" 21" 23"
Seat Width 17.5" 17.5" 17.5"
Handle Height 28.5" - 31.5" 31" - 35" 33" - 37"
Easy to place order and the staff is very responsive. Emails are answered very promptly. Waiting for my walker now.